After celebrating a very exciting and heartwarming twenty-first birthday with my friends and peers, I was ready to experience the wonders that the next day had to offer. January 13, although not quite as large of a milestone as the day before, revolved around the exploration of Ernest Hemingway’s life in Cuba. This was to be a particularly interesting day of our trip because, like Hemingway, I myself am a writer (despite the fact that none of my works are published). Therefore, I was eager to learn about how he lived as a writer and see the different locations of Cuba that inspired his works. To start the day off, our class drove to Old Havana in order to visit Ambos Mundos; a hotel that is famous for being the place in which Hemingway resided for a whole year. On the way there, our professor gave us a short lecture about Hemingway. One aspect of the lecture really stuck out for me. Our professor revealed that Hemingway was one of his favorite authors but that one of Hemingway’s works was one of the most atrociously written pieces that our professor had ever read. This inconsistency made me curious as to why that was so. Our professor claimed that it was because Hemingway rushed the work, to an extent, and that he did not seem to consider the reader while writing it. It was not just our professor who believed this, because the book was widely considered terrible by audiences in general. It was very enlightening to learn that no matter how popular a writer is or how greatly he writes, audiences will not give him a free pass if the writer composes a subpar piece of work. 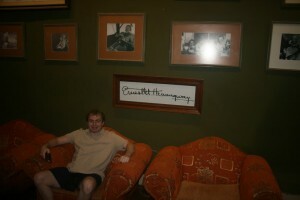 Eventually, we arrived at the hotel and saw how deeply the people there revered Hemingway. There were portraits of him everywhere and his signature dangled from the emerald green wall of the lobby. He had a room on the fifth floor that no one was allowed to stay in, and even if one were allowed to enter it, he or she could not touch or change a single thing in the room. The beige colored room was set up like a museum exhibit. Certain parts of it were tied off with thick rope and Hemingway’s personal effects, such as his trusty typewriter and his small collection of his written books, were encased in pristine glass as if they were ancient artifacts from a prehistorical era. It was pretty amazing to realize how much respect a writer can maintain and command with a stroke of his pen. 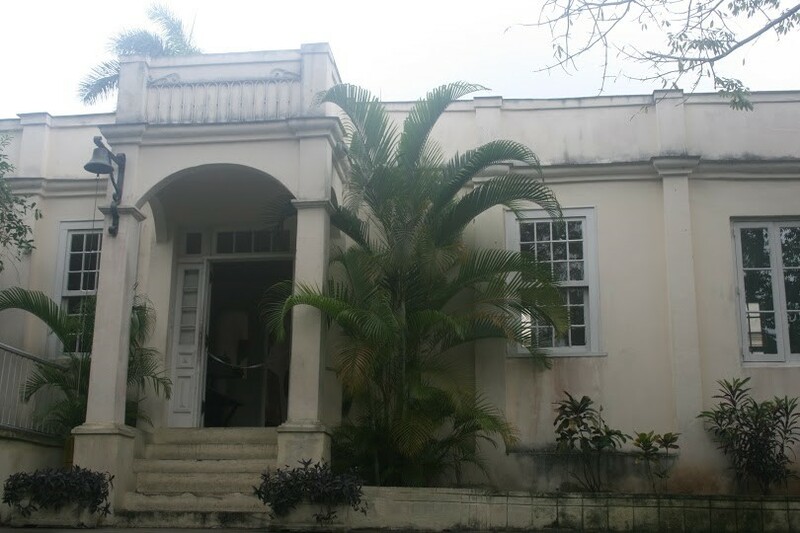 Hemingway’s writing had made such an impression on the Cuban people that they decided to leave the room that Hemingway was staying in as a preserved shrine to him and his accomplishments. A part of me began to wonder if I would ever become that famous in my pursuit of writing. I am not sure if such an outcome will ever happen, but I feel a certain peace in knowing that I will embrace my future as a writer no matter what will occur in my life. Once the hotel visit was over, our group travelled to the town where The Old Man and the Sea took place. The ocean contained a greyish blue hue and it expanded to farther reaches than my naked eye could ever hope to see. The town itself was a very small and isolated area. It seemed like the kind of peaceful place where the main hero of a series would spend some time in a self-imposed exile in order to peacefully recollect himself. Being there was such a rush. Travelling to the setting of a certain novel is always extremely cool because it is a rare event when the words described to you on a page come to life in the real world as the exact place that they were attempting to describe. The same feeling overtook me when we travelled to Hemingway’s house afterwards. That place was the setting for the climactic scene of the novel Adios Hemingway by Leonardo Fuentes. On another note, visiting the house was enlightening because it was able to tell me a lot about Hemingway’s life just by looking inside of it. His army suit in the closet served as a stark reminder of the fact that Hemingway spent a portion of his time as a war correspondent in World War II. The animal heads hanging from his walls showed me that he had a penchant for hunting. The millions of books crowded around in his house told me that he was a man who liked to drown in them. The list goes on and on. Once the visit to the house was over, we did something that was completely separated from anything involving Ernest Hemingway: we saw people shoot a cannon inside of a fortress. The wait for it was long and it was raining on us for pretty much the entire time, but the explosion and the loud crackle that the cannon had fired made the wait well worth it. The cannon was loaded with a blank, of course, but the orange explosion that erupted from the cannon’s black mouth still looked like something from a highly-budgeted film. The people who fired the cannon were dressed in eighteenth century war clothing, and I was convinced that I had been thrown smack dab into the middle of the Revolutionary War. My twenty-first birthday was my twenty-first birthday, but the day of January 13 was still very enjoyable. I got to learn about the life and legacy of one of the most famous American authors of all time and I got to travel to a neat fort and see a cannon go boom. Overall, it was a pretty productive day.